I shot this photograph a couple of weeks ago in Washington DC and just processed it tonight. It was shot in what I call, very unideal conditions, especially for a HDR. But this view of the U.S. Capitol looked great and I wanted to see what I could do. 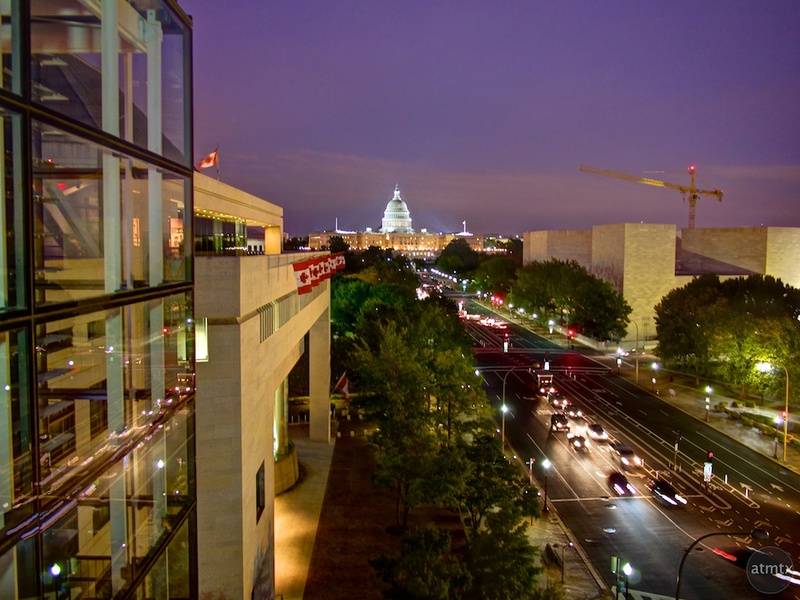 I was at the Newseum, a museum dedicated to news, for an evening event during my conference in Washington. After dinner, I made it up to the top floor and out to the balcony where I saw this. I had my Olympus E-PM2 but no tripod. I did the best I can to grab the scene so that I could make something of the images when I got back. Taking a good photograph here is harder than it looks, especially for a single exposure. It’s easy to blow out the details of the Capitol, especially if you wanted good light levels for the street. Preserve the details on the bright dome and you end up with a really dark exposure. So, yes, this is a perfect opportunity for HDR. The thing is, when shooting HDRs, you really need to keep the camera as steady as possible between the multiple exposures. This helps greatly during post processing when the 3 photos are combined into a single image. I rested my camera on a round hand rail, which helped somewhat, but it wasn’t rock steady. I also had to shoot at ISO 800 to have some hope of non-blurry images. HDR processing typically increases noise so it is always preferable to use the lowest possible ISO, 200 in the case of this Olympus. Well, here’s the result. It came out decent enough, I think. At 100% it’s a bit noisy but looks fine, full size on my 27″ monitor. At web sizes, I think it looks quite good. Glad it took the shot. It was worth the effort. It came out fantastic! Great view of the dome! Andy – don’t sell yourself short – this is really nice work! I’ve not seen a better shot from this vantage point. Thanks Bernard. I think it came out pretty good, considering the circumstances. Now if I had a tripod, it would have been so much better. But oh well. We do the best we can, with what we have.